192. Joseph NOYES was born on 20 Sep 1686 in Newbury, Essex, Massachusetts.32,46-49 He died on 29 Mar 1773 in Atkinson, Rockingham, New Hampshire.26 Joseph NOYES and Martha CLARKE were married on 10 Nov 1715 in Newbury, Essex, Massachusetts.46,50 The Noyes Descendants, Vol. I says 1715. VR says [Mrs.]. i. Joanna NOYES was born on 28 Jul 1716 in Newbury, Essex, Massachusetts.32,52 The Noyes Descendants, Vol. I says 25 Jul 1716.
ii. Humphrey NOYES53 was born on 11 Feb 1716/17 in Newbury, Essex, Massachusetts.42,54,55 He died on 21 May 1790 in Atkinson, Rockingham, New Hampshire.26,42,55,56 He was Farmer.56 Humphrey Noyes joined Capt. Ezekiel Giles’ company of volunteers from Plaistow that reinforced the Northern Army at Saratoga. He died in 1790, at the age of seventy-three. iv. Capt. Thomas NOYES40 was born on 25 Jun 1723 in Newbury, Essex, Massachusetts.26,40,58 He published intentions to marry on 16 Sep 1749.59 He died on 30 Jul 1779 in Atkinson, Rockingham, New Hampshire.26 He was selected to call the first town meeting in Atkinson, New Hampshire in 1767 and served as selectman many years; representative to the Legislature. May 11, 1752 was chosen “to clear the spot for the meeting house” (later Plaistow Baptist Church in 1904). v. Anna NOYES was born on 8 Jun 1726 in Newbury, Essex, Massachusetts.52,60 The Noyes Descendants, Vol. II says 8 June 1727. [p.218] Stephen Little (1719-93) was a member of the general court of Massachusetts 1775. He was born and died in Newbury, Mass. Stephen LITTLE and Judith BAILEY were married on 5 Jun 1743 in Newbury, Essex, Massachusetts.65,68,69 DAR says 1743. VR spells Bayley. Merrick says married on Turkey Hill. ii. Capt. David LITTLE72 was born on 6 Apr 1760 in Newbury, Essex, Massachusetts.72-74 DAR says 1760. He died on 1 Jan 1825 in Newbury, Essex, Massachusetts.72,73,75 DAR says 1825. He was a captain in the militia, held various town offices, served in the legislature, and was a large farmer and extensively interested in real estate at Newburyport and Newbury. 200. Humphrey NOYES53 was born on 11 Feb 1716/17 in Newbury, Essex, Massachusetts.42,54,55 He died on 21 May 1790 in Atkinson, Rockingham, New Hampshire.26,42,55,56 He was Farmer.56 Humphrey Noyes joined Capt. Ezekiel Giles’ company of volunteers from Plaistow that reinforced the Northern Army at Saratoga. He died in 1790, at the age of seventy-three. iii. Humphrey NOYES29,79 was born on 23 Jan 1745/46 in Atkinson, Rockingham, New Hampshire.79 VR Plaistow, NH says 5/29/1749. He died on 16 May 1814.26,41,79 He was a private in Capt. Giles’ company from Plaistow, NH, which joined the Continental army at Saratoga in October 1777. (See NH State Papers, Vol. 15, Revolutionary Pay Rolls, Vol. 2). v. Samuel NOYES80 was born on 25 Aug 1754 in Atkinson, Rockingham, New Hampshire.41,42,59 He died on 9 Jun 1845 in Canaan, Grafton, New Hampshire.81 (Ae. 90y 10m.) Served in the Revolutionary War from Plaistow. Co. Cdr. Ezekiel Giles; Regt. Cdr. Lt.. Col. Jos. Welsh. In the early part of I834 several energetic citizens of Canaan, and prominent among them was the lawyer, George Kimball, procured subscriptions sufficient to build a house, and to buy half an acre of land, for grounds. It was located in the field next south of the Congregational Meeting House, with an ornamental fence in front. There were sixty contributors to the enterprise, and chief among them stood the venerable farmer, Samuel Noyes, for whom the contemplated school was named. The amount subscribed was $1,000, of which sum only $80 was subscribed by the opponents of the school, and only $20 of that was ever paid, the friends of the school offering at that time to assume the whole $80. Application was made to the legislature for a charter which was granted July 4, 1834, to Samuel Noyes, George Kimball, Nathaniel Currier, George Walworth and John H. Harris, as incorporators of Noyes Academy. The charter provided for the “education of youth.” That the corporation could hold estate not to exceed $15,000, to be divided into one thousand shares of $15 each. Property by way of gift could be held to any amount. John NOYES Esq.82-85 was born on 2 Apr 1764 in Atkinson, Rockingham, New Hampshire.41,86,87 He graduated in 1795 in Dartmouth College, Hanover, Grafton, New Hampshire.41,84,87 He died on 26 Oct 1841 in Putney, Windham, Vermont.41,84,86-88 He was buried in Putney, Windham, Vermont.82,83 Maple Grove Cemetery. NOYES, John, a Representative from Vermont; born in Atkinson, Rockingham County, N.H., April 2, 1764; attended private schools, and was graduated from Dartmouth College, Hanover, N.H., in 1795; tutor at Chesterfield (N.H.) Academy 1795-1797 and at Dartmouth College 1797-1799, having among his pupils Daniel Webster at the latter institution; studied theology; moved to Brattleboro, Vt., in 1800 and engaged in mercantile pursuits; member of the State house of representatives 1808-1810 and in 1812; moved to Dummesston in 1812 and resumed his mercantile pursuits; held several local offices in Vermont; elected as a Federalist to the Fourteenth Congress (March 4, 1815-March 3, 1817); resumed mercantile pursuits until 1819, when he retired from active life and settled on a farm near Putney, where he died October 26, 1841; interment in Maple Grove Cemetery, Putney, Vt. Political Graveyard: Born in New Hampshire. U.S. Representative from Vermont, 1815-17. Interment at Maple Grove Cemetery, Putney, Vt.
Noyes, John. Representative in Congress 1815-’17, and for years one of the leading business men of the southeast part of the state. He was born at Atkinson, N. H., a descendant of one of the early settlers of Massachusetts, and of an unusually learned and scholarly family. He was graduated at Dartmouth in 1795, and became a tutor there, and had among his pupils Daniel Webster, who in after life admitted his debt intellectually to the tutor. Mr. Noyes engaged in theological study and fitted himself for the ministry, but gave it up because of ill-health and returned to teaching, had [p.144] charge of the Chesterfield, N. H., Academy for a time, and in 1800 moved to Brattleboro to engage in mercantile trade with General Mann, the grandfather of the wife of Gen. George B. McClellan. There were several famous connections through the firm of Noyes & Mann. A partner of one of its branches, at Wilmington, was Rutherford, father of President Rutherford B. Hayes. Mr. Noyes’ oldest son was John H. Noyes, founder of the Oneida, N. Y., Perfectionist community, which had its first start at Putney. His eldest daughter was Mrs. L. G. Mead, mother of the famous sculptor of that name. The firm did a heavy business, with stores at Brattleboro, Wilmington, Whitingham and Putney, and rapidly amassed wealth. Mr. Noyes represented Brattleboro in the General Assembly of 1808-’10 and 1812, and in 1815 was elected to Congress, serving one term as contemporary with Clay, Randolph and other celebrities. On his return from Washington he moved to Dummerston, where he lived for four years, and then retired from active life to a farm in Putney, where he died Oct. 26, 1841, at the age of seventy-eight. He wedded, in 1804, Polly, the oldest daughter of Rutherford Hayes, the grandfather of the President. 202. Enoch NOYES was born on 25 Mar 1730 in Newbury, Essex, Massachusetts.42,89 He published intentions to marry on 15 Feb 1751.59 He died on 24 Jan 1796.26 Enoch NOYES and Judith KNIGHT were married on 5 Jul 1759.26,42 “Noyes Descendents” says 1759.
i. Lieut. James NOYES90 was born on 16 Apr 1760 in Atkinson, Rockingham, New Hampshire.26,59,91 He died on 18 Jul 1817.26,91 He was a sergeant in Capt. Ezekial Gile’s Company which marched from Plaistow to join in the Northern Continental Army at Saratoga in October, 1777. He was called Lieutenant Colonel in the town records. He discovered the first limestone in the colony at Newbury, and the discovery is said to have created great excitement. i. Rebecca NOYES was born on 12 Jan 1684/85 in Newbury, Essex, Massachusetts.46-49,108 Noyes’ Genealogy says 6/12/1685. vii. Lydia NOYES was born on 30 Nov 1695 in Newbury, Essex, Massachusetts.47-49,117 Newbury VR says Nov. ult., 1695.
viii. Capt. Ephraim NOYES49,114 was born on 25 Dec 1698 in Newbury, Essex, Massachusetts.47-49,109,114 He died on 5 Apr 1779 in Newbury, Essex, Massachusetts.114,116 Ae. 80 y. 3 m. 10 d. He was also known as Ephraim Noyce.118 VR for marriage. Settled on the main road in the West Precinct, Newbury. Estate was inventoried at £6,240. ix. Benjamin NOYES119 was born on 22 Feb 1700/1 in Newbury, Essex, Massachusetts.46-49,120 Will of Benjamin Noyes of Plaistow, NH, made 15 Feb., 1770. To my dau. Sarah £4 &c-. To my sons James and Joseph all my real estate in Plaistow equally between them. Will proved Feb. 19, 1783. Children born in Newbury and Salisbury MA and Plaistow, NH. x. Mary NOYES was born on 13 Mar 1703/4 in Newbury, Essex, Massachusetts.46-49,117 Noyes’ Genealogy says 3/3/1703. xi. Capt. James NOYES55 was born on 19 Aug 1705 in Newbury, Essex, Massachusetts.46-49,54,55 He died before 1757. They removed to Plaistow, N.H. Administration on his estate granted to son Enoch in June 1758.
i. Lydia LITTLE was born on 25 Aug 1717 in Newbury, Essex, Massachusetts.127 She died on 5 Feb 1798 in Newbury, Essex, Massachusetts.128 Ae. 80 y. 6 m.
iv. Moses LITTLE68 was born on 8 May 1724 in Newbury, Essex, Massachusetts.68,124 DAR says 1724 in Newbury. He died in 1798 in Newbury, Essex, Massachusetts.68 Moses Little (1724-98) commanded a regiment at Bunker Hill and was at Flatbush Pass in the disastrous battle of Long Island. He was at Harlem Heights, but ill health compelled him to leave the field. He represented Newbury in the general court. He was born and died in Newbury. iii. Gen. Jacob BAILEY\BAYLEY Sr.141,142 was born on 19 Jul 1726 in West Newbury, Essex, Massachusetts.135,136,142,143 He died on 1 Mar 1815 in Newbury, Essex, Massachusetts.136,142-144 He was also known as Jacob Bailey.135 Jacob Bayley, (1726-1815), who had served in the early wars, was appointed brigadier general of militia, 1776. He was a member of the Committee of Safety and of the first Governor’s Council of Vermont. He was born in Newbury, Mass., and died in Newbury, Vt. His son Jacob acted as scout and served through the war. Bayley, Gen. Jacob. Washington’s most trusted officer in Vermont, who had charge of the protection of the frontier for several years, and who was at different times an advocate of the claims of New York, of the new state, and of New Hampshire to the territory of Vermont, was born at Newbury, Mass., July 2, 1728. He was a captain in the French war in 1736, present at the Fort William Henry massacre in 1757, from which he escaped, and was a colonel under Amherst in the taking of Crown Point and Ticonderoga in 1759. He came to Newbury, Vt., in October, 1764, was in 1775 elected to the New York Provincial Congress, though he did not take his seat, and was one of the most influential men of that part of the state. He was commissioner to administer oaths of office, judge of inferior court of common pleas, and justice of the peace; August 1, 1776, he was appointed brigadier-general of the militia of Cumberland and Gloucester counties, and in 1776 he began work on the celebrated Hazen road, afterward completed by General Hazen, which was designed as a military road from the Connecticut river to St. Johns, Canada. “Gen. Jacob Bayley settled first at Hampstead, N.H. in 1748, and raised a company of which he was captain at the commencement of the French and Indian War, 1756. He was at the capture of Fort William Henry and ran the guantlet at the dreadful massacre that occurred by the violation of the plighted faith of the enemy, in August 1757, and was one of those who escaped to Fort Edward. He was commissioned Colonel by General Amherst, and was with him at the taking of Fort Ticonderoga and Crown Point in 1759. Standing high in government favor for his military service, he was in 1763 given a charter for a township in Vermont, and removed to Newbury in that state in 1764. He was there appointed brigadier-general, and soon after, by General Washington, commissary-general of the Northern department of the army, a position which involved great responsibilities, and subjected him to dangers, difficulties and sacrifices of an extraordianry character. A reward of five hundred guineas was offered for his capture, dead or alive, and it required constant vigilance to escape the scouts sent from Canada to take him. He made a treaty with the St. Francis tribe of Indians, and was looked up to as a father by them and by the friendly Indians. By means of spies he acquired important intelligence respecting the movements of the British, and rendered great service with his purse, pen and person before and at the time of the capture of Burgoyne. Several of his sons served with him against the British. He sacrificed a large estate in the service of his country for which he never received any compensation. He was judge of probate for Newbury district [VT] in 1778, chief judge of Orange County Court [VT] from 1781 to 1791, excepting the years 1783 and 1784. Gen. Jacob Bayley has most appropriately been called the “father of Newbury, Vt.” for he was [not] only the original grantee but also the pioneer mover in most of the important early enterprises connected with its settlement. See Well’s History of Newbury, Vt. for a very full and interesting account of his life. There is much confusion regarding these dates [this statement follows a listing of the birthdates of his children which I’ve not included here]. Book I, Hampstead records, has been followed as closely as possible. After Jacob Bayley settled in Hampstead, he became at once active in church and town affairs, and soon showed himself worthy to lead. The town records show that in March 1746, Jacob Bayley had a pew in the meeting house next to Lieut. James Graves’ at the left hand of the ally in ye miner tear.’ In 1752 the meeting house was apparently still incomplete, and it is recorded that Jacob Bayley bought two pews. He served twice as moderator at the town meetings. He was selectman in 1749, 1756, 1761 and 1762. To be a pewholder at the age of twenty shows a maturity beyond his years. To be elected as selectman at the age of twenty-three is no small distinction. It is interesting to note that his memory is still kept green in the town of Hampstead, not by monument of stone bronze, but by a living tree, a beautiful and stately elm on the farm where he lived while a resident of the town. It is known as the General Bayley Elm, and it was growing when he lived there. It is nineteen feet in circumference at a distance of two feet above the ground. During the week of Aug. 11-16, 1912, was observed the one hundred fiftieth anniversary of the settlement of Newbury, Vt. of which the town, as aforesaid, General Jacob Bayley was the pioneer, father and founder; the most historical patriot of that region, and the illustrious ancestor of a considerable proportion of its present population. Believing that too long his valuable and self-sacrificing service to his town, state and country had not been fittingly and enduringly recognized, a movement led by Hon. Edwin A. Bayley of Boston, and others of Gen. Bayley’s descendants, had resulted in the erection upon Newbury Common of a beautiful granite monument, which was dedicated with appropriate ceremonies upon the afternoon of Aug. 13. Hon. Mr. Bayley’s address upon that occassion, which was spirited and masterly, together with the entire anniversary exercises of the week, may be found in the printed reports of the celebration deposited in many of the large libraries, to which the interested reader is referred. The limitations of this work prevent a full summary of the public life and services of Gen. Bayley, conspicuous in his time for special qualities that have given him a place in history, and, better still, in the hearts and lives of his descendants. 1726 — 1815 New Hampshire 1746 – 1764. The Memory of His Distinguished Capture of Montreal. – – – – – – – – – — Battle of Saratoga. SOURCE — Bayley, Edwin A. & Bailey, Gertrude E., Bayley-Bailey Family — John of Salisbury Branch; Account of John Bayly of Salisbury, Mass., and some of his Descendants. Vol. I at pp. 60-62, edited by Hollis R. Bailey, Boston, Mass. & founded upon the 1899 compilation of Mrs. Abbie F. Ellsworth (1932). He was, in the early years of the struggle between the settlers and New York, one of the most trusted representatives of the authority of the latter, but suddenly changed [p.62] his position in 1777, writing to the New York council under date of June 14, acknowledging the receipt of ordinance for the election of Governor, Senators and Representatives and saying: I am apt to think our people will not choose any member to sit in the state of New York. The people before they saw the constitution were not willing to trouble themselves about a separation from the state of New York, but now almost to a man they are violent for it. He had earlier been chosen by the convention one of the delegates to present Vermont’s remonstrance and petition to the Continental Congress, and he was one of the two representatives from Newbury in the Windsor convention of July 17, 1777, that framed the constitution. Less than a year and a half afterwards, he was a leader in the scheme of the Connecticut River towns on both sides of the river to join together and form a new state, and was chairman of the committee that issued, Dec. 1, 1778, a long public defense of their right to do so. In less than two years from that time he was an emphatic and headlong advocate of New Hampshire’s jurisdiction over the whole of Vermont, and Nov. 22, 1780, wrote to President Weare of New Hampshire: For my part I am determined to fight for New Hampshire and the United States as long as I am alive and have one copper in my hand. But, notwithstanding his erratic state politics, he was unflinchingly faithful to the continental cause, and his later state flops were largely due to his suspicions of the Allens. He warned Washington repeatedly that there was treason afoot. We have half a dozen rascals here, he said, and in 1781 he fully believed that Vermont had been sold out to Canada. British emissaries in the state wrote to Haldimand in that year, that he had been employed by Congress at great expense to counteract underhand whatever is doing for government. He was in 1780 intensely anxious to lead an invasion into Canada the harbor for spoils, thieves, and robbers, as he wrote President Weare. He thought then that the patriot cause was sinking so fast as to make the attempt a vital necessity whatever the risk. He did important service throughout the war in guarding the extensive frontier of two hundred miles, keeping friendship with the Indians, and keeping them employed for the American cause so far as he could. He was in this way constantly in confidential communication with Washington to the end of the war. He was repeatedly waylaid while in the performance of his arduous duties, his house rifled and his papers stolen by the bands of both scouts and lawless men that roamed the forests between the hostile countries. He was a commissary-general during a part of the war. He was a member of the famous Council of Safety in 1777, and the next spring was elected to the Governor’s Council. He was at Castleton in military service in 1777, but appears to have been acting under his New York commission. For the next few years the Vermonters had no use for him, but in 1793 he was again elected councilor by a close margin over John White. He repeatedly represented his town in the Legislature, and was a judge of Orange county court after that county was organized. He died at Newbury, March 1, 1816. He was married, Oct. 16, 1745, to Prudence Noyes. They had ten children, and their descendants have been numerous and respectable. 400. is the same as person number 192. 401. is the same as person number 193.
iii. Samuel N. LITTLE56 was born on 18 Feb 1712/13 in Newbury, Essex, Massachusetts.55,56,134 He lived in Falmouth, York, Massachusetts [Maine] after 1736.56 He lived in Atkinson, Rockingham, New Hampshire in 1741.56 He died on 29 Sep 1792 in Newbury Hill, Merrimack, New Hampshire.55,56 He was Shoemaker.56 Served in the earlier part of the Revolution and was a quartermaster. viii. Richard LITTLE41 was born on 6 Jun 1725 in Newbury, Essex, Massachusetts.41,55,124 He died on 13 Feb 1806 in Newbury, Essex, Massachusetts.41,55,128 He was Shoemaker.41 He studied navigation and made several short voyages but the most of his life was engaged in farming. ix. Enoch LITTLE153,154 was born on 21 May 1728 in Newbury, Essex, Massachusetts.55,155 He died on 21 Oct 1816 in Boscawen, Merrimack, New Hampshire.55,155 He was buried after 21 Oct 1816 in Boscawen, Merrimack, New Hampshire.154 (Corser Hill Cemetery.) Mr. Little was a weaver and shoemaker; and lived near the Upper Green in Newbury until 1766, when he removed to Hampstead, N. H., and in 1774 to Boscawen, N. H., where he subsequently lived. In Boscawen, he settled in an unbroken forest, and endured all the privations of the wilderness. He had become a convert under the preaching of Rev. George Whitefield, at Newburyport, at the age of eleven, and was admitted a member of the old South church in Newburyport, while living at Hampstead. After his removal to Boscawen, he went annually to Newburyport to attend the August communion until he became too feeble. Enoch Little Sr. was a member of the old South Church of Newbury, MA. NSDAR recognized him for Public Service in the American Revolution from NH. iv. Capt. James NOYES29,159 was born on 23 Mar 1744/45 in Atkinson, Rockingham, New Hampshire.160 VR, Plaistow, NH says 3/17/1744. He died on 31 Dec 1831.42,159 He was Farmer.159 He lived in Atkinson, Rockingham, New Hampshire.159 Revolutionary War Private from Plaistow: Co. Cdr. Ezekiel Giles.Served in the French and Indian war. v. Nathaniel NOYES160,161 was born on 21 Dec 1747 in Atkinson, Piscataquis, Maine.160 VR, Plaistow, NH says 12/10/1747. He lived in Boscawen, Merrimack, New Hampshire in 1776.160 He lived in Haverhill, Essex, Massachusetts after 1776.160 He lived in Landaff, Grafton, New Hampshire before 1813.160 He died on 7 Apr 1813 in Landaff, Grafton, New Hampshire.160,161 Ae. 66 y. He is credited with service in the Revolution, having served as a private in Capt. Emery’s company of Col. Baldwin’s regiment, at White Plains, N.Y. When he moved to Landaff he cleared the land of his farm and built a log house, in which he lived several years. It is related that he raised grain and grass, and that it was his custom each winter to take a load to Portland with an ox team, and bring home a year’s supply of groceries. A great snow storm detained him on one trip, and several days passed before he could reach home. His wife, a large, robust woman, getting out of fuel, cut down large birches into fire wood. Nathaniel Noyes (1747-1813) served as a private in Captain Emery’s company, Colonel Baldwin’s regiment, at White Plains. He was born in Atkinson, N. H.; died in Landoff. 768. Deacon Nicholas NOYES 99,162-165 was born about 1616 in Cholderton, Wiltshire, England.47,93,95,96,164,166-171 (NEHG Register, Vol. 149 says about 1614 (aged “about 60” in 1674 according to Ipswich Deeds 4:187). Reminiscences of a Nonagenarian says 1614. The Great Migration says about 1616.) He emigrated on 24 Mar 1633/34 from Southampton, Hampshire, England.164,171-174 (Sailed on ship Mary & John of London, Robert Sayres, Master, on 23 Mar. 1634 with brother James and sister-in-law Sarah. The ship was detained in the Thames where all passengers signed the oath of allegiance to the king and the church 24 Mar. 1634, before they were allowed to sail from London. “Nicholas Noyce” was enrolled at Southampton as a passenger for New England on the Mary & John [Drake’s Founders 70].) He immigrated in May 1634 to Boston, Suffolk, Massachusetts.171 He lived in Ipswich, Essex, Massachusetts after May 1634.164 (Medford was first known as Mistick.) He lived in Newbury, Essex, Massachusetts in May 1635.164,175,176 He signed a will on 4 Jul 1700 in Newbury, Essex, Massachusetts.164,167,177,178 (In the Name of God and by His Assistance I, Nicholas Noyes, of Newbery, in ye County of Essex in ye Province of ye Massachusets Bay in New England do humbly Comitt my soul body and Spirit both in life and death unto ye everlasting armes of God Alsufficient my Heavenly Father and unto Jesus Christ my alone Savior & Redeemer thro ye power & presence of his eternall Spiritt my body to ye earth whence itt Originall was taken in hopes of a happy and glorious Resurrection on ye Great day of ye man Christ Jesus to him be glory both now and Ever Amen. And for my Worldly goods I do dispose as is hereafter expressed. Impr. To ye children of my Son John Noyes (late of Newbery Dec’ed) I give that meadow & upland wch they now posses in my neck of land (excepting only twenty acres of upland next to Henry Shorts Mills wch I do reserve to be otherwise disposed of for fifety pounds wch he oweth me) always reserving liberty for my heirs for ever to pass & repass thro any of ye aforesd lands at Sumer or Winter on ye place or places where we ware wont to pass & repass and further wth upland & meadow is contained in this my gift more than was Inventorized in my said Son John his inventory I do give to my grandson Nicholas Noyes the son of my said son John Noyes over and above his portion I do also reserve to my Self all those points of upland wch run into ye said meadow and are now on my side of ye deviding fence betwene my self and my said sons childrens land. Item, To my son Mr. Nicholas Noyes of Salem I give five shillings in money besides what I have formerly done for him wch is in full of his portion to be paid by my executor. Item To my son Cutting Noyes I give five shillings in money besides wt I have done formerly for him to be paid by my executors in full of his Portion. Item. To my son Timothy Noyes I give all that houseing and land that he now posseseth also one acre of plowland out of ye land that I myself now posses to be laid out by ye side of ye said Plow land that he now posseseth also about Two acres of Plow land and Swamp be itt more or less wch layeth betwene ye land that Moses Little late of Newbery did posses and ye land of Joseph Knight & my owne land and ye land of Lt. Tristram Coffin, also all that my long point of meadow or salt marsh in my neck of land as itt is bounded by ye Mill River on three sides, and ye other side by a line running streight from Henry Shorts Mill dam to ye turne of ye River yt makes ye said point of marsh, also ye one halfe of that marsh wch I formerly bought of Henry Jaques lying in ye great marshes in Newbery also ye one halfe of that twenty acres of upland on my Neck before reserved in this my Will. Also one Quarter part of all my devisions of land already laid out in ye upper Woods in Newbery to me; as also one Quarter parts of all my rights in ye undevided lands of Newbery all wch to enjoy to him and his heirs forever. Also I give unto him all my weareing apparrell I also confirm to him all yt piece of Meadow wch he bought of Peter Cheny lyeing on ye South Side of ye Mill River in Newbery. Item To ye children of my son Thomas Noyes dec’ed I give ten pounds to be paid by my executor in good Currant pay as itt passeth from man to man (not as money) to be paid to ye children when they come of age or sooner as my executor shall see cause. Item. To my daughter Mary ye wife of John French of Salisbury besides what I have formerly given her I give her fiveteen pounds in good currant pay as itt passeth from man to man (not as money) to be paid by my executor wth in four years after my death wch is for full of her portion. Item. To my daughter Hannah ye wife of John Atkinson Sen’r. of Newbery I give five shillings money besides what I have formerly to her to be paid by my Executor wch is in full of her portion. Item. To my daughter Sarah ye wife of Matthew Pettengall of Newbery besides what I have formerly given her I do now give her fifeteen pounds in good marchentable pay not as money price but as it passeth from man to man to be paid by my executor wth in four years after my death wch is in full of her portion. Item To my daughter Rachel the wife of James Jackman of Newbery I give fifeteen pounds besides what I formerly gave her to be paid by my Executor wth in four years after my death in good marchentable pay not in or as money but as it passeth from man to man wch is in full of her portion. Item. To my daughter Abigall Noyes I give all ye linen that I shall have in the house at my decease as Table Linnen & Sheets as also ye best bed wth all ye furniture, also ye parlour dureing her naturall life as also seller room for her convenciency (the house room here mentioned she shall not have itt if she marry also I give her fifety Shillings per Annum dureing her naturall life to be paid to her by my Executor ten shillings of itt in money or in flax or Wool at money price annually and the ye other forty shillings in provision pay at money prices annually my Executor to keep ye said Parlour in good repair at his owne charge. Also I give to her ye fruits of ten Apple trees yearly if she do not marry to be at her owne choyce out of my old orchard. I also give my said daughter one of my brass kettles at her owne choyce & one iron pott & three platters and my tankard all wch is in full of her portion. Item. I do hereby make my son James Noyes my true and lawful heir and do accordingly give and bequeath unto him and to his heirs & assignes forever all my houseing & lands wth all my goods & chattles (not perticularly mentioned in this my last Will and Textamt & otherwise disposed of) together wth all debts due to me by Bill Bond Book or otherwise, as also whatever may be mine and may appear due to me in time to come requireing him to pay all my honest debts & in speciall four pounds in money to his brother Mr. Nicholas Noyes of Salem on the accott. of Maj. Thomas Noyes of Newbery Esqr. as also Twenty shillings to ye First Church in Newbery, my funerall charges to be by him discharged. Lastly. I do appoint my son James Noyes to be ye executor of this my last Will Will and Testament hereby revoaking all former wills of mine. Whereas I have in this my last Will confered certaine lands on ye children of my son John Noyes itt is to be understood that Mary ye Widow of my said son John shall enjoy her thirds of said houseing & lands dureing her naturall life. In Witness whereof I, ye said Nicholas Noyes have hereto as my last Will & Testament sett to my hand & Seal this fourth day of July Anno Dom one thousand & seaven hundred. Nicholas Noyes & a Seal. Signed, sealed & Declared by Mr. Nicholas Noyes to be his last Will & Testamt in presence of us. Will proved Dec. 29, 1701. [Essex Probate Record, 307:233-36 at Salem]. The inventory of the “estate of Mr. Nicholas Noyes late of Newbery who deceased November 23rd 1701,” totalled £1531 4s., of which £1160 was real estate: “36 acres of land with houses, outhouses, gardens & orchard thereupon,” £500; “eighty acres of meadow & sixty acres of upland,” £500; “the outlands namely a freehold lot of about 30 acres and a rate lot of about seventy acres,” £140; and “rights in the commons & undivided lands of Newbery,” £20. Taken by Thomas Noyes, Joseph Woodbridge and Henry Short [EQC 307:236].) He died on 23 Nov 1701 in Newbury, Essex, Massachusetts.49,95,99,164,167,170,179 (Savage, Vol. 3, p.298 and History of Brunswick, Topsham, and Harpswell: Died 11/9/1701. NEHG Register, Vol. 149 says “Mr. Nicholas Noyes of Newbury, aged about 86 years, died on the Lords-Day 9r 23.1701” (“The Diary of Samuel Sewall 1674-1729, M. Halsey Thomas, ed. (2 vols., New York, 1973), 1:458.) He was buried on 23 Nov 1701 in Newbury, Essex, Massachusetts.168,169 Will (proved) on 29 Dec 1701.164,167 Nicholas Noyes was born in Cholderton, co. Wilts, about 1616. He deposed 27 November 1671 “aged about fifty-five years” [Records and Files of the Quarterly Courts of Essex County, Massachusetts, 1536-1686 (EQC) 4:433]; deposed 24 December 1674 “aged about sixty” [Ipswich Land Records (ILR) 4:187]; deposed 31 March 1679 “aged sixty-three years” [EQC 7:165]. He married by 1641 Mary Cutting, daughter of John Cutting of Watertown. Nicholas took the Freeman’s Oath as “Nicholas Noise” in Cambridge on May 17, 1637 when he and eight others walked from Newbury to Cambridge to vote for Gov. Winthrop [Records of the Governor and Company of the Massachusetts Bay in New England, 1628-1686 (MBCR) 1:373]. On April 21, 1638, he was one of five men fined 2s. 6d. apiece for absence from Newbury town meeting after due warning. The meeting was called to order at eight o’clock in the morning. Two of the men (not Nicholas) had their fines remitted, having sufficient excuses. It must have been very soon after this in 1638 that Noyes sailed on a voyage to England, possibly to settle family affairs and to report on conditions in Massachusetts Bay. He returned to New England on the Jonathan which sailed from London, probably soon after April 12, 1639, and “came to Anchor in Boston Harbor.” Also on the Jonathan were Anthony Somerby of Newbury and Mr. Peter Noyes of Sudbury, who, having come over on the Confidence in 1638, aged 47, and found New England to his liking, had gone back to his home in Penton, near Andover, co. Hants, to fetch his family. Peter was doubtless a kinsman of Nicholas. [EQC 1:268; [New England Historical and Genealogical Register (NEHGR), 32:407-11]. When it was proposed to remove the inhabitants of Newbury from their first settlement on the Parker river to a new site nearer the Merrimac, Nicholas Noyes was a freeholder and a deputy “for the managing of those things that concern the ordering of the New Town” on December 7, 1642. He was on the Ipswich and Salisbury grand jury, 29 September 1646, 24 April 1649 [EQC 1:103, 164]; petit jury, 28 September 1647, 26 September 1648, 25 March 1651 [EQC 1:124, 146, 210]. The town voted on November 29, 1652, that a school house be built and that £20 a year be appropriated for the schoolmaster, and Mr. Woodman, Richard Kent, jun., Lieut. Pike and Nicholas Noyes were named the committee to “manage the business” of building a schoolhouse [EQC 2:70]. On 3 May 1654, he was on the Massachusetts Bay committee to enquire about the petitioners in support of Lt. Robert Pike [MBCR 3:345, 4:1:194]. 6 May 1657, he was on the committee to settle the bounds between Salisbury and Hampton [MBCR 3:432, 4:1:292]. Nicholas was appointed “commissioner to end small causes”, or local justice, in 1652, 28 March 1654, 25 March 1656, 31 March 1657, 30 March 1658, 29 March 1659, 25 March 1662, 28 June 1664, 27 March 1666, 1668, 30 March 1669, 16 March 1669/70, 31 March 1674, 27 March 1677, 29 November 1681, 1683 [EQC 1:262, 336, 420, 2:11, 69, 151, 371, 3:172, 355, 4:12, 13, 119, 225, 5:290, 6:249, 8:232, 9:167]. His most important service, however, was as deputy to the General Court in 1660 and in 1678 when on September 19 he was chosen by the town “to serve at the next session of the Court until it be ended,” a special session having been called for October 2 at which the oath of allegiance to King Charles II was submitted and signed by the deputies; he served also 28 May 1679, 19 May 1680, and 4 Jan 1680-84. On 30 September 1679, “Nicholas Noyes” was one of ten Newbury men who “were discharged from ordinary training, each paying one bushel of Indian corn yearly” [EQC 7:263-64]. In the long and bitter controversy between Rev. Mr. Parker and Edward Woodman, Nicholas was one of Parker’s chief supporters. He was chosen deacon of the First Parish of Newbury on March 20, 1683/4. On 26 April 1655, “Nicholas Noyes of Newbury … & Mary my wife” sold to “John Allen of the abovesaid town & county all that parcel of land which was lately William Mitchell’s, which the said William Mitchell purchased of Jno. Knight Senior & John Knight Junior and of John Davis, except the garden plot & the house & that which the house standeth upon & is for the yard, the which land & house being mortgaged unto Anthony Somerby lately by William Mitchell in his lifetime & since his death his wife not being in a capacity to redeem, the said Nicholas Noyes, with the consent of the widow of the said William Mitchell, deceased, have redeamed it the said house and land, and now also with the consent of the said Mary, the relict of the said William Mitchell deceased, & with the consent also of the abovenamed Anthony Somerby to whom the said land and house was mortgaged, he and said Anthony Somerby yielding hereby up all his right & title and interest in the said house & land”; signed by Nicholas Noyes, Mary Noyes, Mary Savory and Anthony Somerby [ILR 1:195-96]. On 13 October 1659, “John Woolcott of Newbury …, carpenter, and Mary my wife” sold to “Nicholas Noyes of the said town and county all that six acres of upland and marsh … lately purchased of Benjamin Swett, granted by the town to Thomas Brown” [ILR 2:69]. On 14 March 1660[/1? ], “John Bond of Newbury … & Esther my wife” sold to “Nicholas Noyes of the abovesaid town & county all that parcel of meadow and upland containing by estimation about nineteen acres” [ILR 2:26]. On 1 April 1673, “Nicholas Noyes and Mary my wife” for a payment of four pounds a year deeded to “our son Cutting Noyse all the right that we have in that farm lying and being on the east side of the way going to Merrimak [illegible] was formerly Stephen Dummer’s … likewise I Nicholas Noyes do reserve four acres of meadow … which is in exchange for Cutting Noyes to have four acres of salt marsh in Holt’s neck, likewise it is agreed upon by Nicholas Noyes and Mary his wife that if the four pounds a year be not paid according to agreement, that then five acres of the plowland and ten acres of the meadow on the south side of the farm the said Nicholas Noyes or Mary his wife may rent out” [ELR 33:8-9]. On 6 April 1682, “Henry Jaquish of Newbury …, carpenter, … with the consent of Anne my wife” sold to “Nicholas Noyes of the abovesaid town …, yeoman, … a parcel of salt marsh lying and being in the Great Marshes in Newbury containing by estimation four acres” [ELR 14:217]. On 5 July 1692, “Nicholas Noyes Senior of Newbury” sold to “Ensign Joseph Knight of Newbury aforesaid all my right, title & interest in a piece of arable land containing three acres … in the township of Newbury aforesaid in a common field there known by the name of the Common Great Field” [ELR 22:146]. On 9 April 1696, “Nicholas Noyes of Newbury” sold to “Samuel Smith of Haverhill … a certain messuage or tenement lying in Haverhill aforesaid containing about twelve acres of land … also three acres of meadow lying in said Haverhill … commonly known by the name of Duck Meadow” [ELR 25:103-4]. On 19 April 1698, “Nicholas Noyes Senior of Newbury” deeded to “my loving and dutiful grandson Nicholas Noyes of Newbury aforesaid, the eldest son of my eldest son John Noyes late of Newbury deceased, … about eighteen acres of upland lying in the township of Newbury … by name of Deacon Noyes His Neck adjoining unto a parcel of upland which I formerly gave to my son John Noyes deceased …, also I give to my said grandson Nicholas Noyes Junior eight acres of meadow … lying in said neck adjoining unto the meadow which I gave to my said son John Noyes aforesaid and was inventoried as his estate” [ELR 15:41-42]. ii. Hannah NOYES was born on 31 Oct 1643 in Newbury, Essex, Massachusetts.47,94-96,99,167,168,179,183,185-187,190 NEHG Register, Vol. 149 and VR says “last of Oct., 1643”. Reminiscences of a Nonagenarian says Oct. 31st, 1643.
iii. John NOYES92,192,193 was born on 20 Jan 1645/46 in Newbury, Essex, Massachusetts.32,47,92,95,96,99,168,187,194-197 He died in 1691/92 in Newbury, Essex, Massachusetts.92,96,179,192,197,198 (Automated Archives and Noyes Pedigree say about 1692.) He was a carpenter.92,194 John grew up in Newbury. He first shows up in town records when he testified in court on 27 Apr 1669 in a case that involved John Woolcott and Peter Tappan on one hand and Nathaniel Cheny on the other. He took the freeman’s oath on 9 Jan 1674 with his brother Cutting. John was a house carpenter who lived in the “farms district”. His house was built in 1677. His home lot originally belonged to John Hull. One of his descendants, Luther Noyes, lived in this house during the late 1800’s. In 1678 John Noyes, John Hale and Francis Tharley fixed the bridge over the Newbury River. John was a juror on 27 Sep 1681. He died in 1691 at the age of 45. He is mentioned in his father’s will as deceased. His widow Mary and son Nicholas settled his estate (personal £309, real estate £246). The account was made on 28 Sep 1694. An inventory of his estate (on 22 Sep 1693) by Tristraim Coffin, Abraham Adams and Joseph Pike revealed his lifestyle. He had a house and a barn on a 12 acre homestead. He had 20 acres of meadow and 30 acres of upland. Animals included 2 oxen, 7 cows, 25 sheep and a horse. He had 2 feather beds, a chest, a table and chairs. Kitchen items included iron pots, a frying pan, tubs, barrels, wooden ware, napkins and table cloths. Tools included carpenter’s tools, husbandry tools, a spinning wheel, a loom and an iron. Other items found in the inventory included clothes, books, arms, pewter and brass ware. From “Genealogical Record of Noyes descendents”: John purchased property for home in “Farms District” after former owner, John Hull, died in 1670. “The house, a substantial ediface, was built in a style unusual for a farmhouse in those early days. The front hall is maniscotted, and a handsome staircase with the elaborately curved balusters, these fashonable for the first class mansions, leads to the second story. The kitchen…was huge even for the period; an ox could have roasted whole in its capacious recess. This homestead was descended from John of the second generation, to his son and grandson Daniel, to Maj. Samuel, to Samuel his son and was owned in 1879 by his son, Luther Noyes. He was listed in the 1688 Newbury tax roll at 5+13 acres. He was listed as deceased in his father’s will of 1700 and also in the entry for his daughter’s marriage in 1700. Sources of information: Vital records of Newbury, Massachusetts, to the end of the year 1849; New England Historical and Genealogical Register (vol:page). “Old Newbury”: In 1677 John Noyes bought of Edmund Moores, Jr. eleven acres of land that had formerly belonged to John Hull, late of Newbury, and was known as Hull’s Plain. John Noyes died in 1691, leaving a family of ten children. He built one half of the house still standing in 1912, the other half built by a later generation. NEHGR: Declared freeman 9 Jan 1673/74. 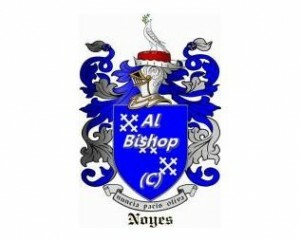 Noyes Pedigree: He died in Newbury, intestate, 1691/92. Rev. Nicholas NOYES Jr.92,199,200 was born on 22 Dec 1647 in Newbury, Essex, Massachusetts.47,48,92,95,96,99,113,168,185,187,201,202 He graduated in 1667 in Harvard College, Boston North, Middlesex, Massachusetts.47,92,168,187,200,202-204 (A.B. [Sibley 2:239-46]). On 19 Dec 1675 he was Chaplain of Connecticut Regiment.92 Great Swamp fight. He was ordained on 14 Nov 1683 in Salem, Essex, Massachusetts.92,202 First Church He died on 13 Dec 1717 in Salem, Essex, Massachusetts.92,168,187,200,202,203,205,206 Ae. 70 y. wanting 8 days. Nicholas Noyes Rev. Born 22 Dec 1647, in Newbury, Massachusetts. Died 13 Dec 1717, in Salam, Massachusetts. Nicholas graduated at Harvard, 1667 (A.B.) and was made freeman 13 May 1669. He was Chaplain of Connecticut regiment at Great Swamp Fight, 19 Dec 1675. He preached 13 years at Haddam, Connecticut and became the seventh minister in Salem, Massachusetts 23 Oct 1682-83 with a salary of £80 and 20 cords of wood annually, and was ordained over the First Church 14 Nov 1683. He officiated as clergyman at the hanging of the witches, 22 Sep 1692, and later in life he repented of his part in the witchcraft persecutions, and did what he could to assist the dependent families. In 1698 he preached the election sermon, and about 1702 wrote the memoir of his uncle Rev. James Noyes, in Mather’s Magnalia. Rev Nicholas never married. Savage, Vol. 3, p.298: NICHOLAS, Salem, s. of the preced. Nicholas preach. many yrs. at Haddam, but having in 1682 a call to S. to assist the venera. John Higginson, he became his collea. ord. 14 Nov. 1683, was one of the promoters of the horrible delusion of 1692, and yet a d. of his noble collea. was one of the accused. He died not altogether lose his faculties, as his let. to Mather of the character of his uncle, wh. is certain. one of the best parts of the strange. compound of materials in the Magnalia; as also a good epistle to John Higginson in London, preserv. in 3 Mass. Hist. Coll. VII. 212, will prove. He d. 13 Dec. 1717, unm. Also, a witness at the hanging of at least 4 “witches” in Salem. Hist. of Salem, Vol III, p.127: The largest library in Salem at this period belonged to Rev. Nicholas Noyes, which was valued at the time of his death at £88, eighteen shillings and eight pence. Books had greatly increased in numbers, and a variety of subject matter. Religious books were not in the great majority that they had been. Hist. of Salem, Vol III, p.408: After the death of Mr. Higginson, Rev. Nicholas Noyes was the sole pastor of the First Church. It appears that he wished to have George Corwin, as a colleague, soon after Mr. Higginson’s death. At length, in May, 1711, he was invited to become a colleague of Mr. Noyes over the First Church here. eminiscences: Preached at Haddam, Conn., thirteen years, ordained over the first society in Salem, Nov. 14th, 1683.
v. Dea. Cutting NOYES93,97,193,207 was born on 23 Sep 1649 in Newbury, Essex, Massachusetts.47,48,92,95,96,99,121,168,187,207,208 He signed a will on 16 Jul 1730 in Newbury, Essex, Massachusetts.92,97,207,209 (In the Name of God amen; The sixteenth Day of July 1730, I Cutting Noyes of Newbury in the County of Essex in his majesties Province of Massachusetts Bay in New England being of perfect mind & memory, Thanks be given unto God, Therefore calling unto mind the mortality of my Body [___], do make and ordain this my last Will and Testament; That is to say Principally and first of all, I give and recommend my Soul into the Hands of God that gave it, [___], and my Body I recommend to the Earth to be buried in a decent Christian Burial at the Discretion of my Executors [___], and as touching such worldly Estate wherewith it hath pleased God to bless me in this Life, I give devise and dispose of the same in the following manner and Form. Impr. I give and bequeath to Elizabeth Noyes my beloved Wife twelve Pounds in money or Bills of Credit and fifteen Ounces out of the Silver I have in my House and all my Stock of living Creatures and all my Household Goods and also I appoint my two Sons John Noyes & Joseph Noyes to keep for their mother, my abovesaid Wife two Cows winter and Summer, and they shall provide for her six Cord of good wood suitable for her and twenty Bushels of Indian Corn and two Bushels of wheat and three Bushels of Rye and six Bushels of Barley and one hundred Pound of good salt Beef, and six Pound of sheeps Wool, and eight Pound of flax [T__] and one third Part of the Apples that shall grow in my Orchard yearly; and I appoint my said two Sons John and Joseph to pay to said mother said Payments yearly the wood to be delivered at the House, and the other Things also, or where she shall order to be delivered, and also I give my said Wife ye Use and improvement of the southerly half of my dwelling House with convenient Cellar room for her and Liberty of using the well for water, and Priviledge of keeping a [___] or [Two?] at the door, and also the Use of a suitable garden spot of Land, and my Will is that my said two Sons shall pay said yearly Payments each of them the one half thereof, and fence said Garden and keep it fenced, all which I give my said Wife in Case she demand no Third or Right of dower in my real Estate, and in Case my said Wife see cause to [marry?] again she shall have none of said yearly Payments so long as she [is?] a married woman, but at all Times when she is a widow she may demand and [___] ye abovesaid Priviledges and Payments, as if she had remained a Widow, and in Case what is above given to my said Wife, be not enough to maintain my said Wife comfortably and Credibly, Then my said Two Sons shall provide for her all [Things?] that she shall want in Sickness and in Health during her Widowhood and at her Decease give her a a decent burial (in Case she be a widow) And further my Will is that what my Wife shall leave at her decease of [what?] is above given her and undisposed of by her, shall be equally divided to and among my [three?] daughters, namely Elizabeth and Bathsheba Pettingall and Mary Moulton, or such as shall legally represent them. 2 To my Son John Noyes [___] his heirs and assigns forever, I give and bequeath the one half [of my?] Land and meadow called my Homestead ye southerly Half of it, from the High Way down to half way [___] meadow and the One half of ye Remainder of ye Homestead and one half of my two Lotts of pasture land in the lower Commons in Newbury, & the one half of my other Land, lately laid Out to my Common Rights, and one half of ye Lands belonging to my Rights in the undivided Lands in Newbury and one half of my Lott of Land at Indian Hill ye southwesterly half by measure, & I give my Son John my Case of glass bottles after ye Decease of my Wife, and I appoint my Son John to pay to his mother ye one half of ye yearly Payments as above given to her. 3 I give to my Daughter Elizabeth Pettingall thirteen Pound in money or Bills of Credit to be paid by my Son John Noyes & Eleven Pounds to be paid by my Executor. 4 I give to my daughter Bathsheba Pettingall ten Pounds in money or Bills of Credit fourteen Pounds to be paid by my Executor & ye sd. ten Pounds to be paid by my son John Noyes. 5 I give to my daughter Mary Moulton ten Pounds to be paid by my Son John Noyes in money or Bills of Credit and fourteen Pounds to be paid by my Executor. 6 I give to my son Cutting Noyes three Pounds in money or Bills of Credit to be paid by my Executor having paid said Cutting his Portion already. 7 I give to my Grandson Jacob Noyes three Pounds in money or Bills of Credit to be paid by my Executor. 8 I give to my Grandson Samuel Noyes four Pounds in money or Bills of Credit to be paid by my Executor. 9 I give to my Wife my wearing Apparell to dispose as she please, & I give to my Grand Daughter Eliza. Noyes fifteen Pounds to be paid by my Executor in one year after My Decease. 10 I give to my Son Joseph Noyes and to his Heirs and assigns forever the northerly half of my Homestead down to half way the meadow, and half the Remainder of ye Homestead meadow, and my Will is that ye lower half of my Homestead meadow shall be equally divided betwixt my two Sons John & Joseph Noyes in Quantity and Quality, and my Half of the Lane called Rolfs Lane, is to be reckoned as a Part of Josephs half of the Homestead, and also I give my said Son Joseph Noyes his Heirs and assigns forever the one half of my two Lotts of pasture Land in the lower Commons in Newbury, and one half of my Lands lately laid Out, and one half of ye Lands belonging to my Common Rights, and one half of my lott of Land at Indian Hill ye northeasterly half of it, and I give to my Son Joseph Noyes ye Buildings on his half of the Homestead, also my Will is that my Sons John & Joseph Noyes and their Respective Heirs and assigns shall have Liberty of passing & repassing over each others Lands herein given to them for the improving the Lands not in Corn Fields or in mowing Lands, but so as may be most convenient and doing each other as Little damage as may be, and my Son Joseph Noyes shall pay to his mother my now Wife, the one half of ye yearly Payments as above given to her, & the Legacies given in this my Will shall be paid within two years after my Decease, and further I give to my Son Joseph Noyes all my Estate both real and personal which is not disposed of in this my Will, and I do ordain and appoint my Son Joseph Noyes to be the sole Executor of this my last Will and Testament to receive all my Debts and to pay all my Just Debts & Legacies as he is above Ordered to Pay and my funeral Charges & my Executor shall provide a Man & Horse and carry his above named mother to and from meeting & at all Other Times as she shall desire (so long as she is a Widow) to be carried from Place [___] and I give to the first Church in Newbury Twenty Shillings, & I do revoke and disallow all f[ormer?] Wills by me made and ratify and confirm this my last Will and Testament [___] whereof I the abovenamed Cutting Noyes have set to my Hand & Seal ye Day and Year above written. Cutting Noyes (seal) He died on 25 Oct 1734 in Newbury, Essex, Massachusetts.92,96,168,207,210,211 (Ae. 85 y. 1 m. 2 d.) Will (proved) on 18 Nov 1734.92,97,207 He was a cordwainer.92,187 He was a Captain-lieutenant in the militia.92 He was Deacon of the First Parish.92 NEHG Register: He was made freeman, 9 Jan., 1673/4, was a cordwainer, captain-lieutenant in the militia, and deacon of the First Parish. Mass. and Maine Families: Represented the town in the General Court 1709-1712. On 10 April 1718, “Simon French and Abigail his wife both of Salisbury” sold to “our brothers Cutting Noyes and James Noyes in equal degrees all our right, title and interest in the estate of our late brother the Reverend Mr. Nicholas Noyes late of Salem … deceased” [ELR 33:221-22]. MAKE JESUS CHRIST YOUR ONLY CHOYSE) He was buried after 21 Aug 1718 in Newbury, Essex, Massachusetts.97,214,217,218 (Headstone in First Parish Burying Ground). Will (proved) on 2 Oct 1718.92,215 Credited with service in King Philip’s war (Nov. 24, 1676). Inventory of will was taken Nov., 1718. Legatees were named: Wife Mary was to have the westerly end of the house; James to have one-fourth of the freehold in the upper woods, which his father gave the testator, also his part of the rate lot; Isaac (deceased), who left wife Jane and child Enoch under 21; Nicholas to be clothes etc, if he learn the trade or mystery of a doctor; Timothy to have the residue, to include most of the real estate, and if he should decease without children, the same to go to said James to be paid out to the other heirs, as Timothy should, and James to be the executor; Abigail, then unmarried; Sarah, who had received a portion of her share; Martha, who had already a part of her share; Mary, then unmarried; Rachael, then unmarried; the daughters Abigail, Mary and Rachael to have liberty to dwell in the back room of the house until married; Abigail to have liberty to take wood from his land at the Neck. His real estate “homestead, 8 acres, valued £200; ten acres in the great field, £24; four acres of land, little meadow, £20; six acres of woodland at the Neck, £30; the wood lots and right in the common, £16; quarter of the Freehold & River lots, £70; quarter of the rate lot upper woods, £80; about 14 acres of salt meadow, £70. Inventory £809, 10 shillings.” The headstone at his grave is still standing in the Newbury cemetery. Savge, Vol. 3, p.298: Freeman 1684. Noyes Pedigree: He was made freeman 13 Feb 1684. 384 ix. Lieut. Colonel James B. NOYES. x. Abigail NOYES93 was born on 11 Apr 1659 in Newbury, Essex, Massachusetts.47,48,92,94-99,185,186,219 Reminiscences of a Nonagenarian says April 1657. She died on 27 Jan 1746/47 in Salisbury, Essex, Massachusetts.219 On 10 April 1718, “Simon French and Abigail his wife both of Salisbury” sold to “our brothers Cutting Noyes and James Noyes in equal degrees all our right, title and interest in the estate of our late brother the Reverend Mr. Nicholas Noyes late of Salem … deceased” [ELR 33:221-22]. i. John KNIGHT III was born on 16 Aug 1648 in Newbury, Essex, Massachusetts.101,102 He died in May 1725 in Newbury, Essex, Massachusetts. iii. Elizabeth KNIGHT was born on 18 Oct 1655 in Newbury, Essex, Massachusetts.92,101,102,207,228,229 She died on 20 Jan 1746/47 in Newbury, Essex, Massachusetts.92,116,207,229 In her 92nd year. vii. Hannah KNIGHT101 was born on 22 Mar 1661/62 in Newbury, Essex, Massachusetts.101,102 She died on 30 Jul 1664 in Newbury, Essex, Massachusetts.102 Died young. ix. Capt. Richard KNIGHT231 was born on 26 Jul 1666 in Newbury, Essex, Massachusetts.101,102,232 He signed a will on 8 Feb 1734/35.231 He died after 8 Feb 1734/35.231 At the birth of his children Richard is listed as a Corporal but in later records he was a Captain in the French and Indian War. xi. Isaac KNIGHT was born on 31 Aug 1672 in Newbury, Essex, Massachusetts.101,102 He died on 29 Jul 1690 in Newbury, Essex, Massachusetts.101,102 Savage says 1690.
ii. Deac. Stephen JAQUES145,242 was born on 28 Jul 1686 in Newbury, Essex, Massachusetts.115,126,242 He graduated in 1707 in Harvard College, Boston North, Middlesex, Massachusetts.242 He lived in Yarmouth, Cumberland, Maine in 1711.242 The town of Yarmouth engaged “Mr. Jaquesh” to keep an English school and a grammar school to teach Latin. He received £24 a year and 5s. a week for board. He lived in Newbury, Essex, Massachusetts in 1713.242 He signed a will on 18 Jun 1771 in Salem, Essex, Massachusetts.145 Mentions his daughter Susannah Noyes. He died before 3 Nov 1778 in Newbury, Essex, Massachusetts.242 Will (proved) on 3 Nov 1778.145,242 Estate was worth £813. He was Farmer, deacon and notary.242 In 1711 the town of YArmouth engaged “Mr. Jaquesh” to keep an English school and a grammar school to teach Latin. He received £24 a year and 5s. a week for board. After marrying Thankful Taylor, they returned to Newbury where he was a farmer, deacon and notary. His estate was worth £813. On 26 Feb 1738/39, he bought of Enoch Noyes, 22 rods of land, with dwelling house thereon, now known as the Ilsley house (95:192 and 98:82 at Salem). On 29 Sep 1752, he sold this house and land to Daniel Clark. iii. Henry JAQUES was born in 1689 in Newbury, Essex, Massachusetts.242 He died on 20 Jul 1723.242 Ae. 35 y.
vii. Rev. Richard JAQUES Jr.126 was born on 1 Apr 1700 in Newbury, Essex, Massachusetts.115,125,249 He graduated in 1720 in Harvard College, Boston North, Middlesex, Massachusetts.125 He was ordained in 1725 in Gloucester, Essex, Massachusetts.125 He died on 10 Apr 1777 in Gloucester, Essex, Massachusetts.115,125,250 (Died in poverty after a long illness.) Minister in Gloucester, Massachusetts. viii. Benjamin JAQUES was born on 23 Sep 1702 in Newbury, Essex, Massachusetts.55,125,126,145,251 He died on 13 Sep 1782 in Newbury, Essex, Massachusetts.125,252 Ae. 79 y. 11 m.
798. Stephen COFFIN was born on 18 Aug 1664/65 in Newbury, Essex, Massachusetts.138,139,255 VR spells Steven. He died on 31 Aug 1725 in Newbury, Essex, Massachusetts.138,139,256 Stephen COFFIN and Sarah ATKINSON were married on 8 Oct 1685 in Newbury, Essex, Massachusetts.136,138,139,257-259 VR spells Steven. 804. is the same as person number 792. 805. is the same as person number 793. 808. is the same as person number 384. 809. is the same as person number 385. 810. is the same as person number 402. 811. is the same as person number 403. Go to my cousin Paul Noyes site http:www.noyesgenelogy.com. He has close to 50,000 families in our tree. There is a SEARCH function where you put the name in. Click search and you will probably find many under that name. You can narrow it down by knowing birthday, death and other information. If you can not find it, email Paul directly, he will find what you need, he has been at it for 50 years.